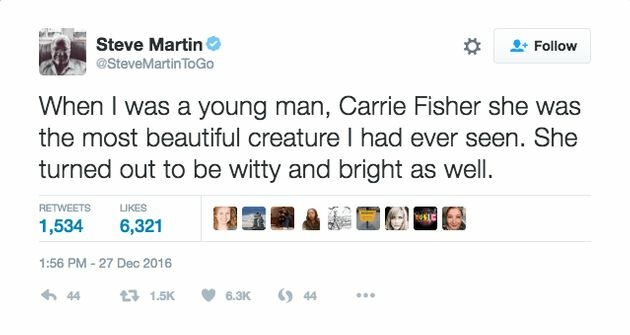 In his tribute to his friend Carrie Fisher, Steve Martin dares to call her beautiful and SJWs of the world unite in their outrage. This demented political correctness police is part of the reason why Trump has won. Carrie Fisher was most recently promoting her book and I saw her on Colbert, with a slightly brain damaged dog that kept licking the air even after she had left. She made some sexual revelations, defending to Colbert’s simulated outrage by claiming that she’d rather reveal it now, when she still looks “passable” then when she’s in her 90s. She also said, a while back, that her mother was the “queen of golden showers” and she was very open about her drug use. Her mother followed her in death only days later. So what was Steve Martin’s tweet (now deleted)? That’s it. What he said is that he first noticed her beauty, and then he was mesmerized by her wit and intelligence. A skillfully wonderful use of the few characters Twitter allows. 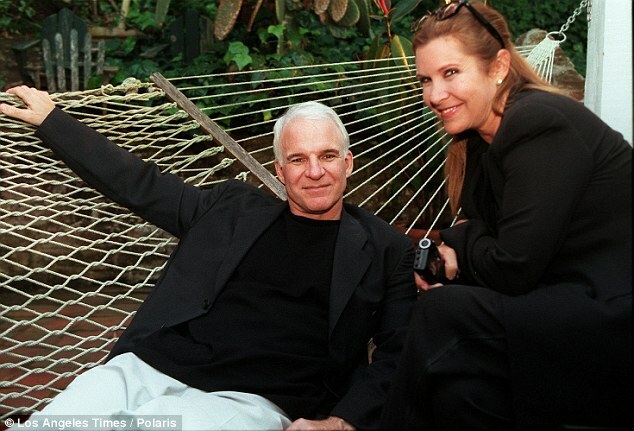 And then, a bunch of people had no real connection to or understanding of Carrie Fisher, (i.e., not at Steve Martin’s level) started sharing their opinion about his tweet. Here’s a sample of Internet idiocy, courtesy of Cavan Sleczkowski. Firstly, HuffPo is quoting with “she apprised to be”?!? You meant “aspired”, dipshit. Kudos to Huff Po for not correcting it, you really care about your readers. While she may have talked the talk about sexism and ageism, her friend would know better what compliments meant to her and how she wanted to be remembered. Appearance is important for everyone (more important than it needs to be, if you ask me), and especially for aging actors. It’s one thing to try to manage expectations and keep them low so you can beat them and another to believe all that BS of it “not mattering”. I’m sorry to say, that even without the glaring misquote, FoxNews coverage was far better than HuffPo. Cinnabon also faced criticism for a tweet they sent out saying, "RIP Carrie Fisher, you'll always have the best buns in the galaxy." They deleted their tweet. Fox News (and DailyMail) managed to at least include a number of tweets in support of Steve Martin, leaving me with the feeling that there is still hope in this galaxy. Let us now turn to Noam Chomsky’s explanation for Donald Trump’s win (hint: it’s neoliberalism, stupid). Noam Chomsky talks about those left behind by neoliberalism. Here’s a summary of his points. In an environment of decreasing opportunities, scapegoating makes a lot of sense. Politically correct policies that run contrary to common sense and to what people perceive as being their reality can only punish the political candidate espousing them, even when that candidate’s opponent is a conman who has a very tenuous relationship with logical consistency and thinking in general. Women care a lot about their appearance and seem to invest far more time and resources in it than man. Granted, that may be changing, but we see that in societies that give women even more freedom, women tend to use it in the direction of further emphasizing gender role differences (i.e., patriarchy) rather than equality. This is especially true of aging actresses, whose agents often stop calling and who find themselves forgotten by directors. Undoubtedly, Carrie Fisher felt that herself. An actor himself, Steve Martin knew (much like any sentient being) that appearances matter and oftentimes, despite what people might profess publicly, complimenting one’s appearance is the way to their heart. This is particularly true when we’re young and we’re driven by our atavistic instincts far more than our (often non-existent) wisdom. To claim that any of Carrie Fisher young fans had been infatuated with her by anything other than her looks – she was an actress, FFS! – is to insult your reader’s intelligence. Steve Martin was attacked by people using political correctness as a device to gather publicity and piggy-back on a tragic event. And that is why Donald Trump won: people saw his declarations about his daughter liberating. In contrast to Hilary Clinton, always saying what’s right, he appeared authentic (yes, Heidegger be praised) and it no longer mattered that he self-contradicted and was generally almost as incoherent as Rob Ford on crack. Every politically correct idiocy creates a desire for authenticity that is so deep and unfulfilled that any imbecile with a loudspeaker is apt to quench it and walk away with the plebs’ votes. Elsewhere, we learn that it may have been racism, after all, while Oliver Stone explains why it wasn’t the Russians (fb-osru).